ARTICLE: INDONESIA – THE POLITICS OF MAY DAY, 2014. 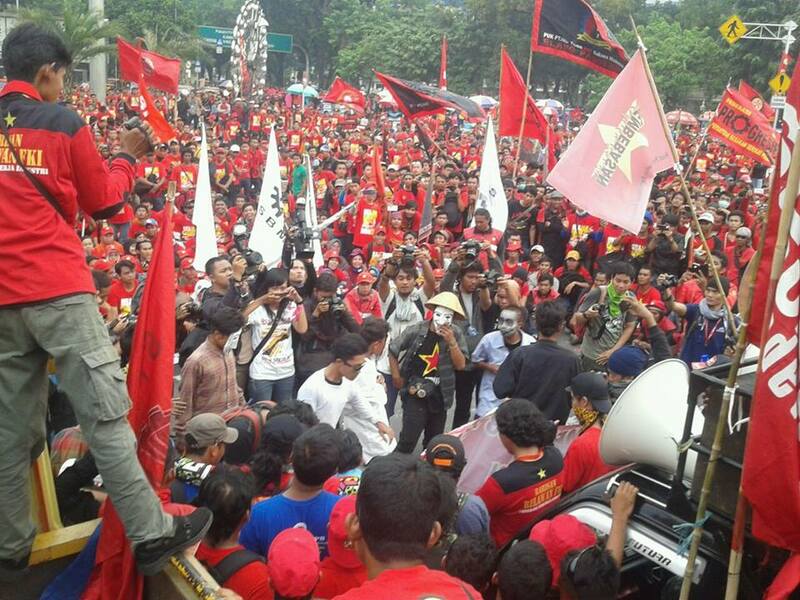 Around 250,000 workers, members of various trade unions, mobilised in Jakarta for May Day, 2014. From all accounts, the mobilisations were similar to those of 2012 and 2013. The demands carried on workers banners and posters were for rises in minimum wages and the banning of the widespread labor hire practices. From the hundreds of photos on facebook, posted by workers from their Chinese made handphones, it appears that the mobilisations in Jakarta as well as other cities, were dynamic, colourful and had a strong activist atmosphere about them. It is a sign that the trade union movement which has developed during the last 15 years remains strongly organised and that worker consciousness remains form on issues relating to immediate conditions. At the same time, various political moves by some trade union officials have set the framework for trade union politics to enter a new phase of internal struggle. The setting for these moves is the upcoming Presidential elections, following the parliamentary elections that were held on April 9. While the exact line-up of presidential candidates is yet to be officially confirmed, there have been two people campaigning hardest to get the support they need to be nominated as candidates in mid-May. These are Joko Widodo, from the Indonesian Democratic party of Struggle (headed by Megawati Sukarnoputri) and Lt-General (ret) Prabowo Subiantio, head of the Greater Indonesia Movement Party (GERINDRA). Widodo himself has secured the support needed to be nominated, namely from another small party, Nasional Demokrat, headed by multi-millionaire media tycoon Surya Paloh. (Paloh and his media group played a leading role in unseating Abdurahman Wahid as president in 2001.) Prabowo is still to confirm enough additional coalition support to have the 25% of votes in the legislative elections or 20% of seats in the House of Representatives to nominate. There are other possible candidates, but these two have been doing the running since April 9. Joko Widodo has been leading in all the polls: usually by around 60% to 40% in most two-horse race polls. Over the last few weeks the various larger union federations and confederations have been announcing or preparing to announce who they support. Two of the biggest union confederations – the KPSI and KSBSI – quickly came out in support of Widodo. The central leader of the KPSI is the son of the Minister of Labour in an earlier Megawati Sukarnoputri government. These are the unions that have been less militant in 2013. In 2012 they were both part of the Indonesian Worker and Labourers Assembly (MPBI) that organised a huge national strike. They declined to take part in the 2013 National Strike, saying that major wages rsises were not yet due. A new coalition had to be formed to organise the 2013 national strike. This was the Koordinasi Nasional Gerakan Buruh (KNGB). The GKPB has its core an alliance between the Federasi Serikat Pekerja metal Indonesia (FSPMI) – the biggest and best organised assembly factory workers union – and an alliance of small left wing led unions, called the Sekretariat Bersama Buruh (Sekber Buruh). This alliance was not as all encompassing as the 2012 alliance. In 2012, Sekber Buruh was not part of the organising alliance, but mobilised separately on the same day as the national strike. The FSPMI has been at the forefront of most of the larger mobilisations demanding increases in minimum wages and greater regulation of labour hire. Their red and black uniformed GARDA METAL brigade have played an important role in spearheading mobilisations and boosting confidence of workers in the face of intimidation from employer-funded thugs. Increasingly however, the central leaders of the FSPMI, in particular its president, Said Iqbal, appear to be playing more and more opportunist politics. After aligning with the moderate unions in 2012, who then withdrew from mobilising in 2013, Iqbal turned briefly to the socialist and leftist unions in SEKBER BURUH. Then starting around March, 2014 there were more and more signs that Iqbal would through his union behind Prabowo Subianto as Presidential candidate. 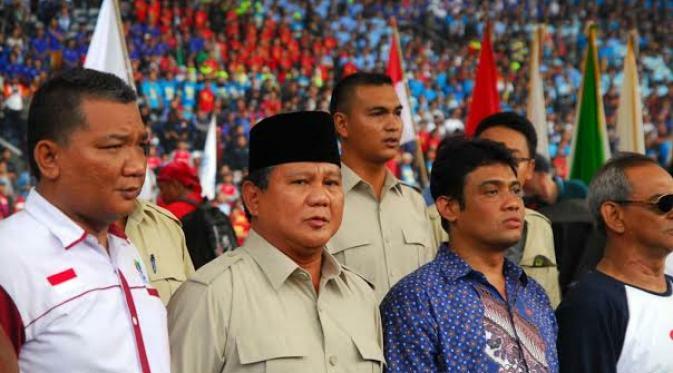 On May 1, at a gathering of at least 50,000 workers in the main Jakarta sports stadium, Iqbal gave the platform to Prabowo to speak and to declare his Confederation’s support for Prabowo’s presidential campaign, should he be successfully nominated. Said Iqbal (in blue shirt) with Prabowo (wearing black cap) at May Day rally. Iqbal’s decision will most likely begin the unravelling of the FSPMI as an effective union. 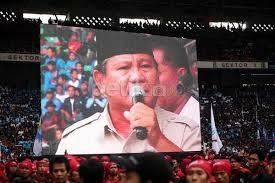 The decision to support Prabowo was taken at the leadership level with no membership discussion. This reflects an increasingly bureaucratic approach by the leadership group. In 2013, union solidarity activists and educators for FSPMI, Danial Indrakusuma and Sherr Rinn, were expelled and prevented from continuing their education and media activities for the union after consistent supporting militant and progressive educational material and policies. Then as the pressure to “Go Politic” increased, a plan for the whole membership to elect the union members who would be presented to political parties as candidates in the legislative elections was ditched in favour of the leadership choosing them. Several later became candidates for different political parties under a “Workers Go Politics” slogan, but without a proper process of building member support their campaigns had little impact. None received the necessary vote quote to be elected, however two did end up elected after their parties passed on to them surplus votes from the party list. Iqbal will face increasing dissent not only from democratic and progressive minded workers, already semi-organised inside the union, but also from workers who have left the FSPMI to join other alliances or to form single enterprise unions. Inside the union also, there are other forces. Another central leader, Obon Tabroni, who was also active in mobilising for the 2013 national strike, is rumoured to have joined the PDIP. He supported PDIP candidate for West Jakarta Governor in 2013. While he appeared on the podium with Iqbal and Prabowo on May Day, he will most likely align with Joko Widodo’s candidacy. As the decision to support Prabowo, was taken behind closed doors, there is no confirmation whether there was a vote at the central leadership level or was it unanimous. Most, though not all, of the smaller unions led by members of socialist groups or progressive union leaders are to be found in Sekber Buruh. On May Day this year Sekber mobilised around 20,000 workers, an advance on previous years. Also a largish progressive union, KASBI, that usually separates itself from Sekber unions, combined in the field with the Sekber unions this year. Sekber is not supporting any of the candidates and is stressing the need to build both an alternative union confederation and an alternative political party, based on the labour movement and other popular classes. (Neither a trade union based social democratic party nor a socialist party has existed in Indonesia since 1965.) A committee of some Sekber members and other groups then formed the Committee for an Alternative Politics (KPA) to propagandise for these ideas. The socialist political groups in the KPA include the Indonesian Struggle Union (PPI), the People’s Congress Organisation – Working Peoples Association (KPO-PRP) and the Peoples Liberation Party (PPR). Among these three, the PPR has also been emphasising a “Fight Militerism” campaign, specifically targeting Prabowo Subianto. 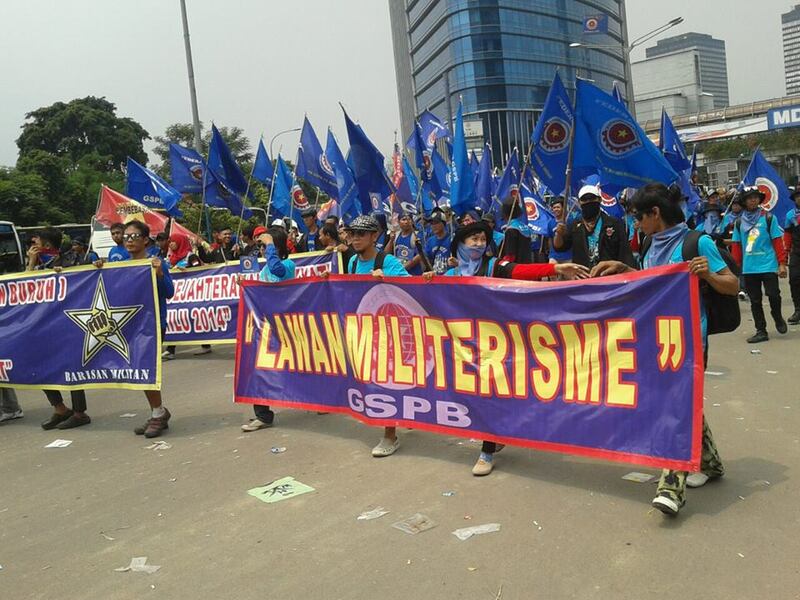 Gabungan Solidaritas Perjuangan Buruh (GSPB) union bearing a banner: FIGHT MILITERISM.